As awareness of IDDSI grows in the world of food and nutrition services, implementing this framework is on the minds of many foodservice managers. You may be wondering, what exactly is IDDSI? IDDSI is an acronym for the International Dysphagia Diet Standardisation Initiative. This initiative was put together by an international team of volunteers including dietitians, speech therapists, nurses, and physicians. Their goal was to standardize the language surrounding texture modified foods and beverages. Texture modified foods and beverages are particularly important to those with dysphagia, a swallowing disorder affecting 1 in 25 Americans each year. Long-term care, skilled nursing, and intermediate care facilities are particularly aware of this condition. The elderly and those with intellectual disabilities often suffer from the disorder at higher rates than the general population. If you are involved in the foodservice production or management of any of the above institutions, or another health care facility, starting with liquids can make for an easy transition to the new dysphagia standards. Altering the texture of foods and beverages provides additional safety for those with dysphagia. Although some types of dysphagia only require foods to be texture modified, some individuals also need modified beverages. The IDDSI framework consists of 8 levels. Levels 0-4 describe beverages. Below is a diagram that can help you understand the new labeling language. The diagram compares beverage classifications between the National Dysphagia Diet (NDD) and the new IDDSI framework. Beverage recipes are easy to manipulate. Applying the new IDDSI framework often means altering existing recipes. Modifying beverage recipes can be a simple task. Often, a thickener is enough to modify the drink to the correct texture. A registered dietitian can help you determine the ratio of thickener needed for each level of modification. Be sure to include steps for testing within your recipes. IDDSI outlines testing methods that guarantee the prepared food or beverage meets the criteria for each level of modification. Testing liquids calls for a simple test called the IDDSI flow test. 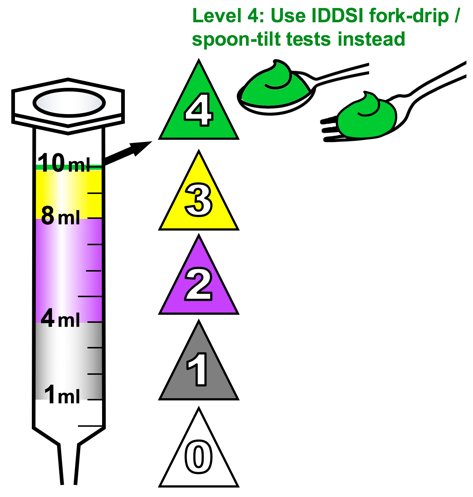 This test involves allowing a 10mL sample of the beverage to flow through a syringe and measuring how much is left in the syringe after 10 seconds. Thinner liquids flow faster, leaving less behind. Thicker liquids flow slower, leaving more behind. Each level has a range of the acceptable amount of remaining liquid. One thing to note is that Extremely Thick (Level 4) liquids are synonymous with Pureed (Level 4) foods in the IDDSI framework. The flow test is not appropriate and the fork test and spoon test must be done to confirm texture. 3. Purchasing thickened beverages eliminates some steps. Purchasing thickened beverage products can eliminate some of the steps involved in transitioning to IDDSI. Many food companies have already adjusted their labels to display the new IDDSI levels along with NDD labeling. This makes it easy for staff to become familiar with the new labeling and terminology. Having thickened beverages in stock eliminates the need for recipes or modifications - simply adjust your diet orders. Implementing IDDSI can be a large project to take on. Nonetheless, this new framework ultimately helps to improve patient safety. It is seen as a standard of practice by many professional organizations, including the Academy of Nutrition and Dietetics and the American Speech-Language-Hearing Association. Starting the application of the IDDSI framework with liquids can propel you toward an easier full implementation. Interested in more information about IDDSI? Click here to get your top 17 IDDSI tips! Click here to view a recent webinar about IDDSI . Comment below: What has been the biggest challenge in implementing the IDDSI framework in you facility?